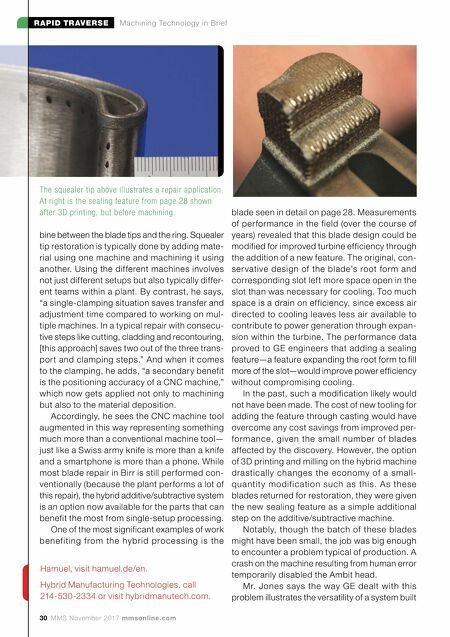 30 MMS November 2017 mmsonline.com RAPID TRAVERSE Machining Technology in Brief bine between the blade tips and the ring. Squealer tip restoration is typically done by adding mate- rial using one machine and machining it using another. Using the different machines involves not just different setups but also typically differ- ent teams within a plant. By contrast, he says, "a single-clamping situation saves transfer and adjustment time compared to working on mul- tiple machines. In a typical repair with consecu- tive steps like cutting, cladding and recontouring, [this approach] saves two out of the three trans- port and clamping steps." And when it comes to the clamping, he adds, "a secondary benefit is the positioning accuracy of a CNC machine," which now gets applied not only to machining but also to the material deposition. Accordingly, he sees the CNC machine tool augmented in this way representing something much more than a conventional machine tool— just like a Swiss army knife is more than a knife and a smartphone is more than a phone. While most blade repair in Birr is still performed con- ventionally (because the plant performs a lot of this repair), the hybrid additive/subtractive system is an option now available for the parts that can benefit the most from single-setup processing. One of the most significant examples of work benef iting from the hybrid processing is the blade seen in detail on page 28. Measurements of per formance in the field (over the course of years) revealed that this blade design could be modified for improved turbine efficiency through the addition of a new feature. The original, con- ser vative design of the blade's root form and corresponding slot left more space open in the slot than was necessar y for cooling. Too much space is a drain on efficiency, since excess air directed to cooling leaves less air available to contribute to power generation through expan- sion within the turbine. The per formance data proved to GE engineers that adding a sealing feature—a feature expanding the root form to fill more of the slot—would improve power efficiency without compromising cooling. In the past, such a modification likely would not have been made. The cost of new tooling for adding the feature through casting would have overcome any cost savings from improved per- formance, given the small number of blades affected by the discovery. However, the option of 3D printing and milling on the hybrid machine drastically changes the economy of a small- quantit y modif ication such as this. As these blades returned for restoration, they were given the new sealing feature as a simple additional step on the additive/subtractive machine. Notably, though the batch of these blades might have been small, the job was big enough to encounter a problem typical of production. A crash on the machine resulting from human error temporarily disabled the Ambit head. Mr. Jones says the way GE dealt with this problem illustrates the versatility of a system built The squealer tip above illustrates a repair application. At right is the sealing feature from page 28 shown after 3D printing, but before machining. Hamuel, visit hamuel.de/en. 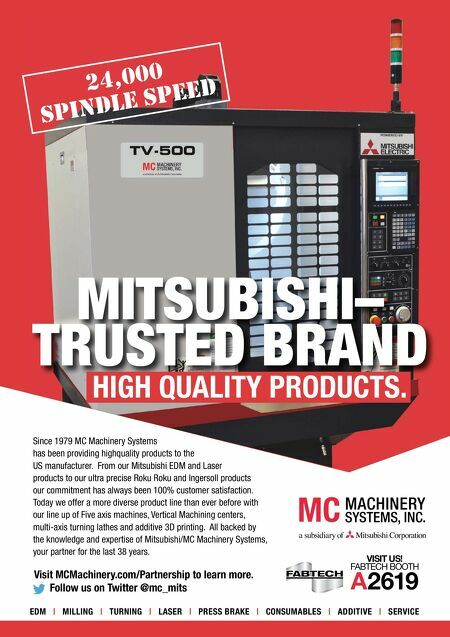 Hybrid Manufacturing Technologies, call 214-530-2334 or visit hybridmanutech.com.